It’s Spring (well, in Australia anyway): the bees are a’swarmin and the birds are a’swoopin – all in the cause of protecting their offspring. Attacks have been so relentlesss in my street that a neighbour contacted the local Councillor for help. 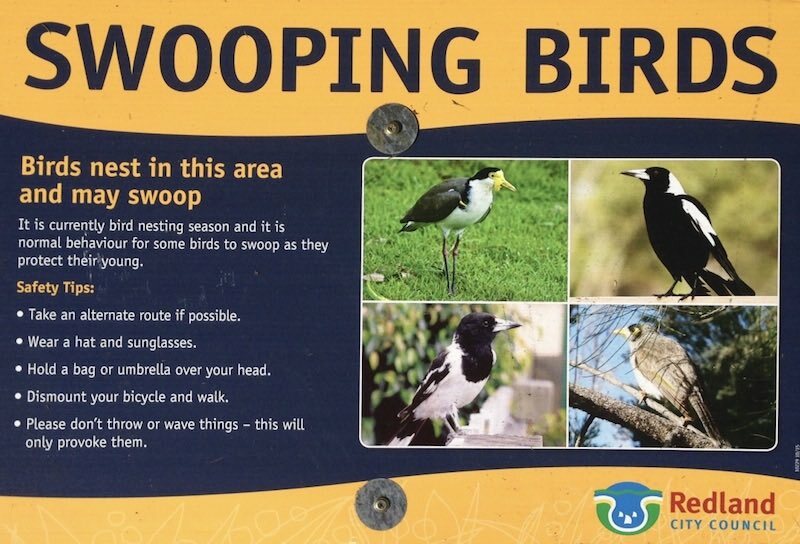 The above sign was the Council’s answer to the birds. Personally I think it would make a great name for a house. There is something poetical about it – something in the vein of ‘Honeysuckle Cottage’. The added bonus is that it might keep unwelcome hawkers outside your property, in much the same way as ‘Beware of the Dog’ warnings – and you don’t even need to keep one as a pet!